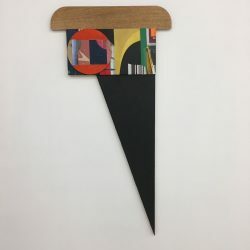 In Laurence Noga’s second project at the C&C gallery, he has developed his preoccupations with collage and calculated colour, drawing the audience into a peripheral world of imperfect geometries. In trying to keep the work open from a perceptual /psychological angle, he wants to create a dialogue with an external reality and a personal relationship to his own history. The term ‘open system’ points to the way in which Noga develops his constructions and paintings. The systems painter Malcolm Hughes talks about an abstraction of characteristics. In this context, he wants us to think about the methodology in constructing the artwork from the physical nature of the materials used. Another word’s as (Hughes) says ‘the mapping of the material concept onto or into the material object’. Noga’s recent work combines an industrial /geometric aesthetic with more personal themes and undercurrents. The work always begins through the use of collage. These are made in an intuitive, very fast manner, perhaps on old exhibition invitations. The format is initially deliberately small, and panoramic, which helps to decide composition and scale. Phenomenology underpins the construction of assemblages, which are often developed from found items, such as from his father’s collection of objects and memorabilia in his garage. They pull the viewer into the surface implications, perhaps eliciting a human response to the mysterious and forgotten elements, and their poetic sense of history. A long term interest in the “Bauhaus’ particularly Moholy Nagy, Josef Albers and Paul Klee drives the unpredictability /predictability of the colour handling. These relationships aim to disorientate the viewer, as surface facture is used translucently, or with a sudden density. The colour is often disbursed, or used in compartments, to create a deliberate, odd depth of field. Noga is aiming to develop through the traces or residues (both temporally and spatially) a system reliant on the environment, and the constant experimentation with materials. The architectural construction and composition creating a kind of industrialization of memory. Born in London, Laurence Noga graduated from (Byam Shaw) Central St Martins, University of The Arts London in 1991, receiving the Post Graduate Award of Merit for Fine Art. He is an Artist, Curator, Writer. Recent exhibitions include: Open System C&C Gallery London January 2018, Entr’acte : Intermission Galerie Abstract Project Paris 2017: Collyer Bristow Make /Shift 2017, Sluice Art Fair 2017, Merge Visible Curated by Charley Peters : Contemporary British Painters 2017, Undead Painters 2017, Extended Process – Saturation Point Projects, Saturation Point Space 2016, Summer Mix, Turps Gallery, Turps Space 2016, From Centre : Slate Projects and Saturation Point Projects 2015, Colour and Otherness – Grace Teshima Gallery, Paris 2014, GB/Switch/ NL – APT at Pulchri Studio, Den Haag, The Netherlands 2014. Recent curatorial projects include ‘Imperfect Reverse’ with Saturation Point Projects at Camberwell Project Space, touring to Anglia Ruskin University (2016). ‘Borderline (beyond a rational aesthetic)’ C&C Gallery , London 2015 and ‘Intuition anti Intuition’, Lion and Lamb gallery, London (2012). Noga writes for Saturation Point projects, and currently lectures at the University of the Arts London.